Below is my written Report from my investigation at The Colonial Bar. Unfortunately The Colonial Bar has now been demolished....luckily i was able to be have access to the location a few weeks before it changed hands (and soon after demolished) and conduct a investigation into the claimed paranormal activity what is said to take place at the location by the old owner (Katie). When i was conducting research into the location it was classed in at Hampshire's 2nd most haunted location so that ticked all the boxes for me to want to investigate the location. • There has been a grey lady witnessed by various people (which happened since a seance). • A Little child has been claimed from mediums who have been there, who mimics voices. • Scott is the main spirit there, who use to own the land...known for not liking people at his land. • The owner at the time (of our investigation) has experienced the feeling of being followed, heard footsteps, bangs throughout the location. • Staff members have felt like they were grabbed whilst working, Builders have quit the job without notice due to tools/equipment being moved. • Shadow figures have been lurking around the background. • Unexplained & mimicked voices have been heard from various people. I conducted an EMF sweep of the entire location - it was all as expected no unusual readings what to be expected from a pub/bar. 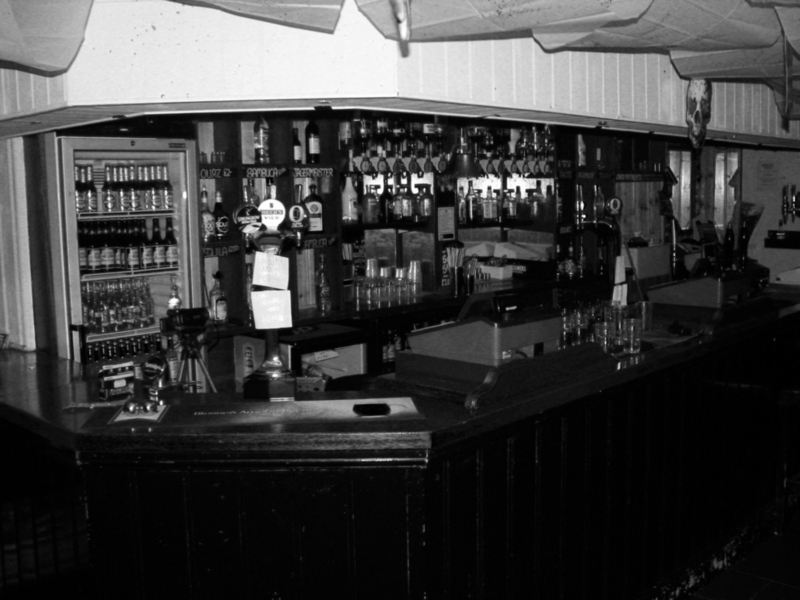 Before the investigation started i went around taking photographs of the whole bar - again nothing unusual captured, it was done to reference key areas of the location. This investigation there was 2 of the owners present, myself, dark knights (ghost hunting team) , 2 guest mediums (who’s names I cant remember!). After setting up equipment i had a infrared DVR system setup around the bar, as-well as some handy-cams placed around with a laser grid being recorded in attempt of capturing the shadow figures claimed in the area they were originally seen by the witnesses. - Nothing was seen via the Lasers throughout the whole investigation. The mediums decided to start the investigation off with a seance at the seating area next to the stage. There was the 2 mediums, both owners , most of the Dark Knights team...Myself and the rest of DK were watching close by we were just observing the seance with digital recorders and cameras, EMF meters roughly about 3 meters behind them. It did not take long until strange events were starting to happen, there was very obvious temperature change happening around us to the point when we had to start investigating and try to debunk the events but couldn't there was no fans on or drafts that we were able to find, there could of course of been a environmental build up over time and we were simply experiancing something very natural but it literately feel like empty spots of temperature and would disperse and quick as it arrived. I Also heard disembodied voices behind me that was captured on my digital recorder but it was too faint to clearly analyse without mass modification to the original file. There was EVPs being captured heard from DK through live EVP sessions (using headphones) and The mediums said the child spirit was there during the séance, There seemed to be movement around the back part of the bar - we could all hear walking but everyone was still, it lasted for a few second there couldn't be an obvious source that any of us investigating was able to discover and was the only time we experienced it. myself & 2 DK's members went into the house attached to the bar (where the owners lived) to start investigating and left the mediums, DK, Owners conducting the seance. We started in the owners kitchen are conducted an EVP session - i was using a full spectrum handycam and a digital recorder and was able to capture a disembodied voice we all heard whilst communicating during analysis I left it unknown as I wasnt able to make out if it even said anything it was a very deep groan.....however there seemed to be little activity happening so we went room to room doing the same all with nothing further experienced. We stopped our investigation of the house and went back to the main bar to spectate more of the mediums. The mediums and some others decided to do a human pendulum what completely ruined the investigation for me, even through it was an investigation with no actual results prepeared to the claims it was a great location to visit. I found that the mediums were creating the results to fit the questions and objectives of the evening, when the owners became suspicious of their results during the pendulum and threw them off with specific questions what the spirits would be sure to know they had no interactions from the otherside. Shortly after this...we all decided to close down the investigation as it did not seem at the time that much of anything was happening and likely to start happening. My overall view of the mediums .... no credibility i would never investigate with them again...all the information seemed to be findable on google and all "activity" all night only seemed to be focused on them - it seemed like enforced pareidollia methodology. Dark Knights team were a good bunch had a lot of fun talking and investigating with them....although lacked a massive haunting as claimed it was a good vigil and very happy that i got access to the location weeks before owners changed and demolished. This blog is based upon a report of paranormal investigation which is an informative topic for those people who are aware of it to some extent. Therefore, I will suggest them to go through from http://www.rushmyessays.co.uk/ once carefully and highlight the important facts and figures which are mentioned here. Presently in this advanced age we can't survive without the current and quick innovation and on the off chance that we look in our life we see that innovation turn into the piece of our life and cell phone is the one a player in http://www.thebestessayshelp.net/ innovation and its turn into the extremely fundamental piece of our life we can't envision our life existence without. Great report, I really impressed by everything you did in the content. This is an informative topic for those people who are aware of it to some extent. I read your previous posts, it was amazing. Keep up the effective work and share some more informative posts, Thanks.